Genie and I went snowshoeing with our dog Smokey this morning. We got two feet of snow in the last week, but it has been 40+ degrees for the last two days, and the snow is to crisp and glazed over to ski our trails. So, we got out the snowshoes. Our last snowshoe trek found us in the deep, wet snow on the north side of the mountain, sinking in eighteen inches with each step and dragging out six inches of snow each time we pull the snowshoe out of the hole. So, this time we decided to trek up to the trail on the east side of the mountain. It gets much more snow, and we figured we would be able to snowshoe on top of the crust. It worked. We took off across the slope up to the trail. Smokey was bounding off into the deep snow and coming back to our trail when he got tired. We made it up to the trail junction by the old dead snag. We had laid a track down this trail a week or so ago, and we could still see the faint path, though covered by the fresh snow. When we hike in the snow, we see all sorts of tracks, turkeys, grouse, rabbits, deer, elk, squirrels, bobcats, bear and the occasional mountain lion. We are much better at identifying the bobcat tracks since we saw one in the drive, and could take a close look at the tracks he left. 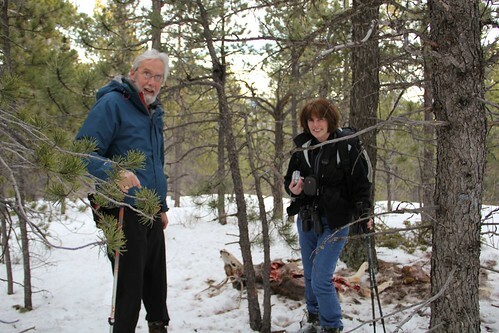 We had made it maybe 400 yards out from the house when some large tracks crossed our trail, coming down the mountain. The tracks were big 4-5" and looked round. I pointed out the tracks to Genie, and said this has to be a deer or elk, as big as they are. She gave a curious look. "It looks like it was dragging something." I could see what she meant, but it did not connect. I looked up the hill, and wondered if we were seeing a place where an elk had bedded down. The bull Elk make a big round depression in the snow where they sleep for the night. Then I looked down the hill and saw something that did not fit. The tracks went under a branch that was not over 3 to 4 feet off the ground. "That's wierd," I said, "how did an elk or a deer go under that branch without breaking it. Then, we both realized we must be looking at mountian lion tracks. We'd seen them before, and it fell into place. Then, I looked down the hill about 10 feet below our trail, where Smokey was nosing around. Lo and behold, there was a freshly killed mule deer buck laying in the snow, with a rack of antlers with at least 8 points (4 points out here since hunters only count one side out here). His belly had been ripped open, and some meat was gone, but it was obvious that the lion had only had one meal off this kill. 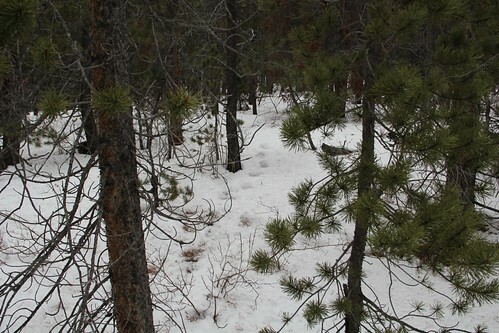 Here is a Mule Deer buck of about the same size looking for danger on the hill behind the cabin. Mountain lions are notoriously protective of their kill. Usually they cover the kill with branches to camoflage it from other scavengers. This guy was laying naked in the snow. All of a sudden, we realized that the lion was likely still very close by the kill. I remember the story of a mountain lion killing a high school trail runner a few years ago. When people came out searching for him, they found him covered with brush with his belly sliced open. The found the mountain lion lurking a few yards away, keeping an eye on the kill. They shot and killed the critter. I wish I had a camera with me to take a picture of the kill, but the adreneline started flowing, and we realized we needed to beat a hasty retreat before we encountered the lion. We called the dog close and headed quickly back the way we came, keeping an eye out behind us. Lions are a little more visible in the snow, but are masters of stealth, and are rarely seen before an attack. We trekked back towards the back side of the mountain, and followed our trail down the hill. We saw deer tracks heading up the hill, and speculated that the lion had tracked the deer and chased it into the deep snow where he killed it. Mountain Lions do not like the deep snow, and I told Genie that it would be happy to use our trails through the deep snow. We also saw more bobcat tracks following a rabbit trail. What an exhilirating morning. We followed our trail back to the driveway and beat a path to the cabin. There is a thrill living in the wilderness of God's creation at the wildland interface. Keep close track of dogs and children, and don't go walking alone at dusk. Critters lurk in the night. After I posted this piece, our friend Beverly Gholson emailed back wanting to come up and try to get a photo of the lion. Beverly spent a winter in Idaho helping dart and collar mountain lions, and has considerable experience. Find the story of her experience here. Here are two pictures from Beverly's Blog entry to give you an idea of what mountain lions look like. Here is Beverly with a darted lion. 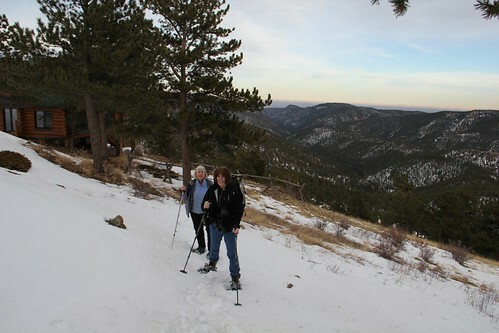 Once Beverly arrived, we put our snowshoes back on, left the dog in the house and quietly hiked back to the kill. Here Genie and Beverly follow me up the slope. I felt more confident with three of us that the cat would not attack. I told Beverly, "I know I can't outrun a mountain lion, but I think I can outrun you." 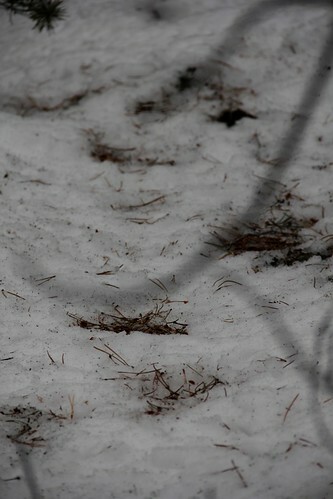 We have arrived at the kill site, and you can see the tracks in the snow. You can see the pine straw blown into his prints. Tracks go back up the hill from whence the lion came. When we looked at the kill, we realized two things. First, the lion had moved the deer, it was laying on its other side. 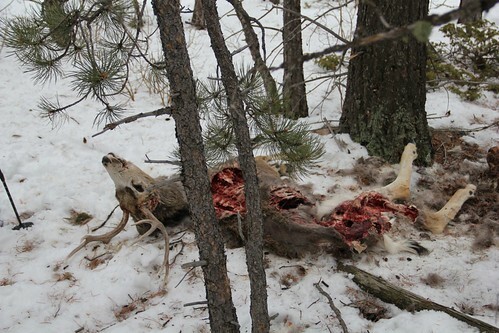 Second, the lion had continued feeding on the deer, it was much more mangled than when we saw it this morning. Here Beverly and I stand in front of the kill. Warning, the following pictures are a bit graphic in nature. stop here if you don't want to see a partially eaten deer. You can see that the lion has opened up the abdomen, and taken out and eaten the major organs, usually the first thing eaten. We found the stomach pulled out, not appetizing since it is just full of plants. The rear leg had the meat taken, along with lips and one ear. The fur was splayed out behind the deer, and was not that way this morning. You best believe we were keeping our eyes peeled as dusk came. We were looking up in the trees, and keeping an ear out for any odd sounds. While I had my camera and would have loved a picture, Mountain Lions are quite dangerous, unpredictable, fast and strong. They have been known to jump up into a tree with a deer carcass. When I talked to Beverly this morning, she asked if I had been back up there. No. After the carcass is completely cleaned by the scavengers, I plan to go get the head and antlers to keep a momento of this find. If I haven't grossed you out yet, shall I keep trying? Then check out the video below! Mountain Lion in the Back Yard from Gregg Burch on Vimeo.